Starting with the Passion Sunday blessing of palms we enter Holy Week, the most sacred time of the Church year. While many attend the Palm Sunday and Easter Sunday celebrations, there is so much more that transpires during this week. If you have not done so in the past and are able to attend the Holy Week celebrations, I would certainly invite you to do so. On Monday, April 15th the Chrism Mass, at which the blessing of the holy oils (Oil of Catechumens, Oil of the Sick) and the sacred Chrism used in the sacraments, will be celebrated at 7:30PM at St. Robert Bellarmine Church in Freehold. Bishop David O’Connell is the principal celebrant, assisted by the priests of the Diocese attended by people throughout the diocese – it is truly a wonderful experience in the solidarity of the local Church of Trenton to see so many turn out in common celebration. On Holy Thursday, April 18th we celebrate the Mass of the Lord’s Supper in Visitation church at 7:30PM. This marks the end of Lent and the start of the Easter Triduum (meaning “Three Days”) commemorating the Paschal Mystery (the suffering, death and resurrection) of Jesus. The Thursday evening Mass observes the Mandatum (the washing of the feet) as we remember Jesus instituting the Sacrament of the Eucharist, as a parish we formally receive the oils blessed at Monday’s Chrism Mass, and follow with the Procession of the Blessed Sacrament to the Garden of Repose and silent adoration. On Good Friday, April 19th (a day of fasting and abstinence) the Commemoration of the Lord’s Passion and Death will be held at 3PM in Visitation. This special service (celebration of Masses are forbidden by the Church on Good Friday and on Holy Saturday before the Easter Vigil) vividly recalls Jesus suffering for our sins. Silent veneration of the Cross follows. We will also have a Living Stations of the Cross at 11AM on Friday. On Saturday April 20th, after sundown, we mark the Resurrection with the most glorious celebration of the Church: the Easter Vigil Mass at 8PM, beginning with the blessing of the Easter fire and the Celebration of Light, we recount the salvation history – of which we are a part – that culminates with the Light of the World, Jesus Christ himself. At this Mass we will also celebrate the sacraments of Baptism, Confirmation and First Eucharist for the Elect and Candidates of the RCIA (Rite of Christian Initiation for Adults). 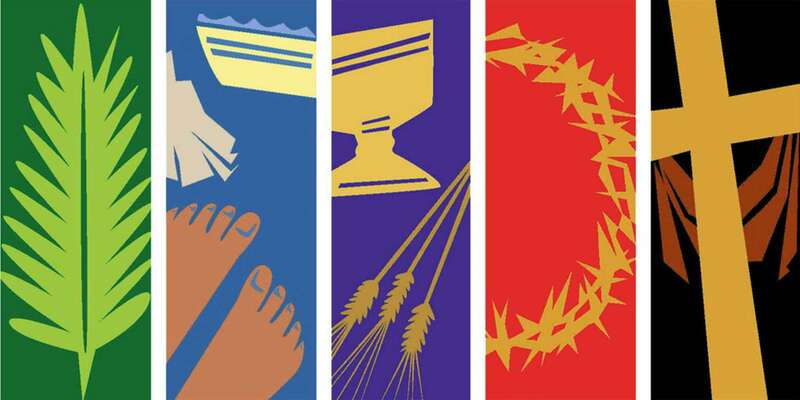 Consider taking part in any or all of these celebrations, as well as the opportunities for 8AM Morning Prayer, 8PM Tenebrae services (the Liturgy of the Hours – the “prayer of the Church”) or the blessing of Food for Easter at 1:30PM on Holy Saturday. There’s so much that happens between Palm and Easter Sunday; make it extra-special this year and be a part of it! In this presentation, Matthew Leonard focuses on the new idea of love proclaimed by Christ and how it gives meaning to human suffering, penance, and ultimately death. Sounds a bit dark, doesn't it? But it's not! By looking at these issues we'll discover the secret to how we can "Rejoice in the Lord always" (Phil 4:4) just like St. Paul, no matter what happens.